I'm finally finding a spare half hour here and there to look through some of my Christmas Books. In my opinion, the contents and the quality of the production of each one of these titles is remarkable and I can see all three becoming firm favourites. 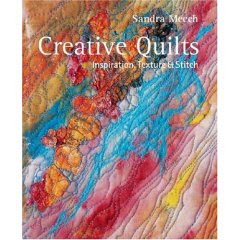 First off the pile is Sandra Meech's latest title Creative Quilts I think the boundaries between quilting and embroidery are so fuzzy now that it's hard to make a distinction (though I know there will be some traditional quilters out there who will disagree!) There is such an immense wealth of inspiration in this book for anyone working with textile arts and I trust the title will not discourage anyone from taking a closer look. Every page could start a journey towards a new project or bring fresh ideas to enliven an existing one. I can't wait to begin trying some of the suggestions! Next off the pile is one I didn't feel I needed to look inside before adding to my Amazon wishlist, such is my confidence that any book by Maggie and Val would be full of goodness. 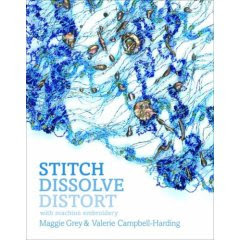 I felt I really needed to add Stitch, Dissolve, Distort to my collection and sure enough, it's got all the reliable ideas and technical know-how to refer to time and again. I like the way that this book returns to some of the old favourites such as whip stitch, reminding me that some techniques are so solid that they remain useful and adaptable in spite of the all the new products appearing. The photography in the book is great and the layout follows in the same vein as previous titles by Maggie and Val. Sad to think that once we get the Embellisher title in our hands, we will benefit no more from Val's incredible creative talent. She's sadly missed. Finally one which I definitely needed to look inside before it found a place on my list. I'm wary of such titles, many of which simply seem to be full of other peoples' journal pages open for copying. I have no use for such books, neither do I want product-heavy "project" ideas. this one is neither. 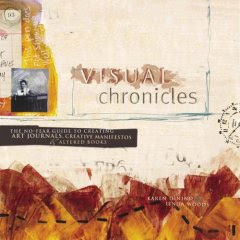 Beginning with some fairly basic principles, Visual Chronicles: The No-Fear Guide to Art Journals, Creative Manifestos and Altered Books by Karen Dinino and Linda Woods goes on to explore several aspects of building these "visual chronicles" - not so much sketchbooks, not really journals, for the ideas in the book are not centred upon recording events in a diary as such but far more about using the medium of a blank page to record creative responses to all manner of "pressed buttons". There's practical advice and encouragement to inspire and though I don't think I need/want to work through this book from beginning to end, there are several things I intend to try as soon as possible, in the hope that I might establish some better journal/sketchbook keeping habits.